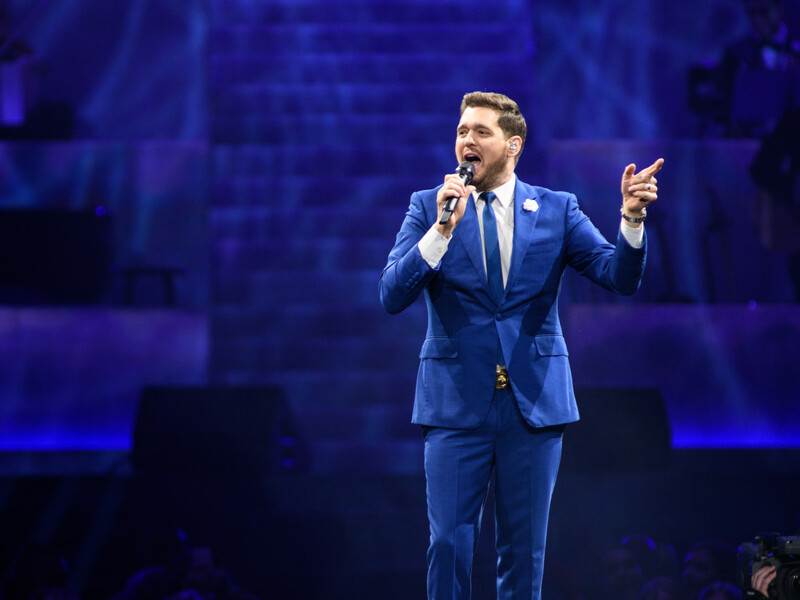 Toyota Center transformed into a 1950s Las Vegas casino as Canadian singer Michael Bublé took a packed audience on a time machine thrill ride on March 26. The performer was back on the touring circuit, promoting his new album, Love, after a three-year hiatus following his son Noah's liver cancer diagnosis, treatment, and recovery. He looked rejuvenated and svelte in a dapper, blue designer suit and tie, his award-winning vocal prowess on full display. To many music fans, Bublé is too earnest and too much of a throwback to earn their attention, but he won over the crowd composed of a wide demographic almost immediately with a charm and charisma very few artists can claim. He started the night with the early hit, "Feeling Good" from 2005's It's Time, a James Bond theme if there ever was one, walking down a massive bandstand that harks back to the days of Sinatra, Dean Martin, and Sammy Davis Jr.
A 32-piece orchestra, including strings, brass, piano, keyboards, and guitars brought a huge sound to the arena while an extended runway allowed the singer to get intimate with a large portion of the audience. Bublé referenced The Rat Pack early and often with a set comprised mostly of cover songs. But that's part of his schtick and what makes him so adored by audiences worldwide. At one point, he told the well-known story that he first got into the era of crooners through his grandfather, who loved big band, '60s swing, and a time when men drank hard, told off-color jokes, and could woo women with their silky-smooth vocals. Bublé performed his perfunctory hits, like "Haven't Met You Yet" from 2009's Crazy Love, "Everything" from 2007's Irresponsible, and "Nobody But Me" from the 2016 album of the same name, but the show really soared when he gave into his old school impulses, performing much-loved cover songs. No surprise that Sinatra got some love early on with "My Funny Valentine," which Bublé joked "was kind of a dark song." Dean Martin got time in the spotlight with "Sway (Que Sera)," allowing Bublé to show off his fluent Spanish (his wife is Argentinian model Luisana Lopilato)," and the classic "You're Nobody 'Til Somebody Loves You." Louis Armstrong featured on two-songs with "Lazy River" and "When You're Smiling (The Whole World Smiles with You)." A three-song interlude in the middle of the arena that Bublé likened to his early days of playing seedy nightclubs included the Louis Prima smash "Just a Gigolo," and Chuck Berry's "You Can Never Tell," perhaps the best moment of the night. 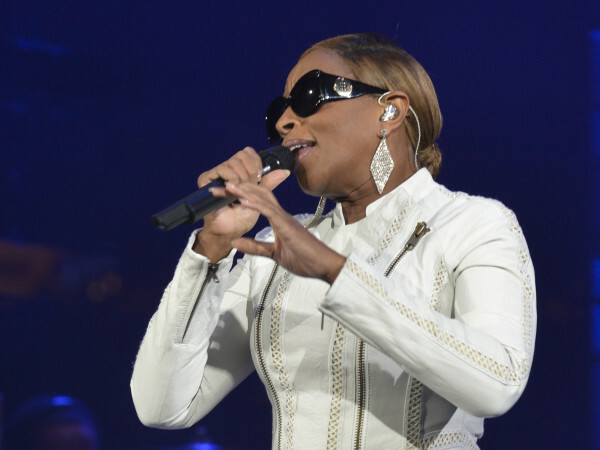 But the singer's major talent, other than his beautiful singing voice, was his ability to connect with the audience. He came with a Rolodex of jokes, talking about the sexiness of the Texas accent, recalling the zombie-like appearance of Floridian fans at his first tour stop in Sarasota, or sharing his love of Kenny Rogers — at one point busting out into an impromptu version of "The Gambler." He took the time to sign posters, greet kids in the audience, FaceTime with a young fan at home, and even sing a duet of "Me and Mrs. Jones" with a woman in the audience, who was absolutely, and in no way was a plant (she totally was). Very few performers can exude the charm to win over 15,000 concert-goers, including jaded music critics, but Bublé did so with panache and professionalism that left all those who came to see him very happy for his return to the stage. "When You're Smiling (The Whole World Smiles with You)"